The National Association of Home Builders, collaborating with MetLife's Mature Market Institute, recently conducted a study to determine Baby Boomers' current housing preferences. The study concludes that the ongoing recession has resulted in buyers' increasing focus on economic issues, with a decreasing focus on design considerations. The study, "Housing Trends Update for the 55+ Market," can be found here. 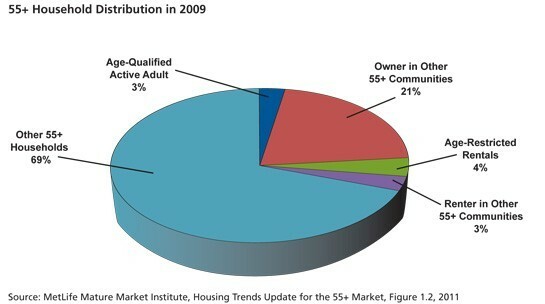 The figure above illustrates the current distribution of housing choices for the aging Boomer market. "I DON'T HAVE ANY CASH, AND MY CREDIT CARDS ARE MAXED. CAN I PAY BY TWEET?" 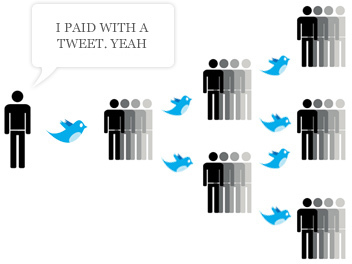 Would you prefer to get paid in cash for what you sell, or would you rather give your product away in exchange for a Tweet? Some people would prefer the latter option. A new website allows musicians, publishers, authors, and others to give their work away and get payment in the form of a favorable Tweet or a Facebook "like." Here's how it works.